Yulia Tymoshenko : The Two-Way Yulia Tymoshenko has been a critic of President Viktor Yanukovych. Supporters say she was put in jail on trumped-up charges. Now, parliament has voted to decriminalize the law she allegedly broke. 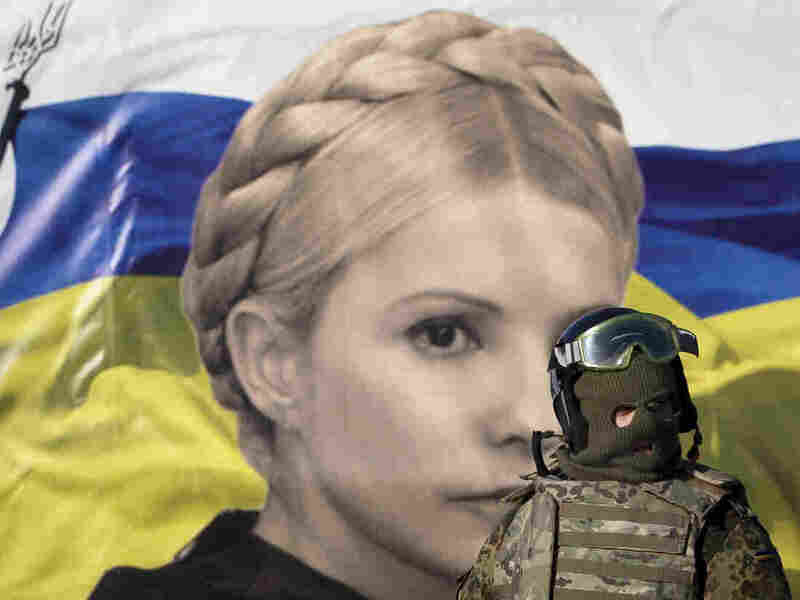 In Kiev last month, this anti-government protester in protective gear stood in front of a poster featuring an image of former Prime Minister Yulia Tymoshenko. Her jailing on what supporters believe were bogus charges was among the complaints protesters raised. Former Ukrainian Prime Minister Yulia Tymoshenko, who has been in jail since 2011 on what her supporters say were trumped-up charges aimed at silencing one of President Viktor Yanukovych critics, may soon be free again. "Ukraine's parliament on Friday voted for amendments in the criminal code which could pave the way" for her release, Reuters writes. According to The Wall Street Journal, "in a snap vote in parliament Friday to decriminalize the article of the criminal code that she was jailed under, 310 lawmakers voted in favor in the 450-seat chamber." If Yanukovych refuses to sign the law, "the vote count Friday indicates there is enough support to override a veto, which requires 300 votes," the Journal says. "A court would then order her release once the law is printed in the official government newspaper." As we've reported before, in 2011 the now-53-year-old Tymoshenko was sentenced to seven years in prison. A judge ruled she had overstepped her powers as prime minister in 2009 when she approved a gas deal with Russia. The year before her conviction, Tymoshenko had narrowly lost a bid for the presidency in an election won by Yanukovych. Time magazine reminds readers that Tymoshenko was a hero of Ukraine's 2004 Orange Revolution who "helped expose Yanukovych's fraudulent victory in the presidential elections that year. She was elected prime minister in 2007 and gained fame throughout the West." "In December 2010," Time continues, "Ukraine's General Prosecutor's Office charged Tymoshenko with misusing state funds while serving as prime minister. She denied the allegations and argued she was being targeted for standing up to Yanukovych, saying 'The terror against the opposition continues.' After a trial that she called a 'political lynching,' Tymoshenko was convicted in October 2011 of abuse of power, banned from seeking office and sentenced to seven years in prison." The Journal adds that "Tymoshenko is unlikely to make an immediate return to politics. She has for months requested treatment in Germany for a back complaint. Serhiy Vlasenko, a close ally and lawyer, said she can barely walk and will need at least a couple of months to recover." Her image has been among those carried by protesters in Kiev in recent weeks as they pressed for Yanukovych to step aside.